It seems odd to me this is actually a vintage recipe. 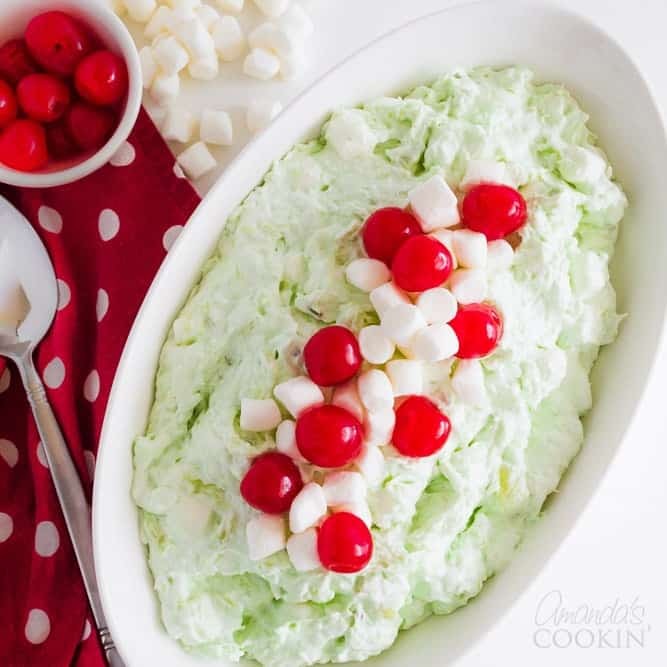 After all, Watergate salad was something I ate at family gatherings when I was a child, reminiscent of Ambrosia Salad which is also deemed a vintage recipe, always on our holiday table as well. I think it’s probably safe to say that just about everyone has tried this pistachio pudding salad recipe at least once. Maybe you’ve adapted it, changed the ingredients around a bit. Added more of this or taken out some of that. Some people don’t like the coconut, others want fresh fruit instead of canned, or maybe you prefer fresh whipped cream over Cool Whip. No matter what your version is, I’m sure it’s as easy as 1, 2, 3, just like this one is. 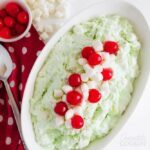 Lime Jello Salad (also called Martian Salad or Seafoam Salad) is sometimes confused with Watergate Salad. However, this jello dessert does not contain anything pistachio, but rather lime flavored gelatin and several similar ingredients to Watergate, such as pineapple and Cool Whip. This is more like a whipped Jello mousse, similar to my Mandarin Orange Mousse, which is made with gelatin, orange segments and whipped topping. 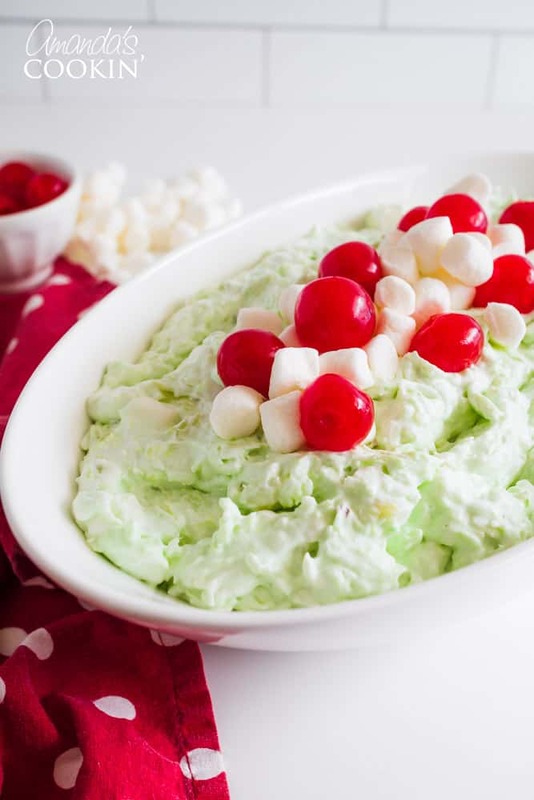 Pink Watergate Salad is another term I’ve seen thrown around, but honestly, that’s just Ambrosia Salad where the maraschino cherries were not rinsed after they were drained, therefore tinting it pink. There’s also a pink fluff type dessert that uses cherry pie filling, pineapple, and several other ingredients. Neither of these are Watergate Salad. A low-fat version of Watergate Salad can be achieved by using fat-free pistachio pudding and fat-free Cool Whip. This is still a sugary dessert, so keep that in mind, moderation is key. A diabetic friendly low-sugar version can be made by using sugar-free pudding, sugar-free Cool Whip and unsweetened flaked coconut. Also, make sure you buy canned fruit packed in juice, not syrup, and check the labels for “no added sugar”. You can even find sugar-free miniature marshmallows in the healthier options area of your grocery store. Why is it Called Watergate Salad? The history of Watergate Salad is an interesting read! There are a few different stories about where the name came from. The recipe was developed by Kraft Foods in 1975 (back then is was General Foods), the same timeframe when their pistachio pudding was launched. At that time General Foods called the recipe Pistachio Pineapple Delight. Kraft Kitchen claims that a Chicago food editor changed the name in order to generate interest when it appeared in her column. That story was never verified or proven. 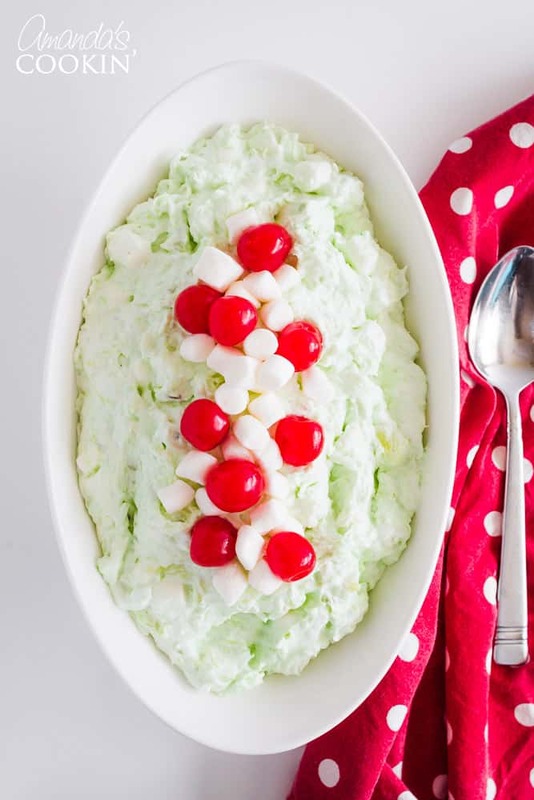 In 1976 The Denver Post published a recipe called Watergate Salad that was supposedly a concoction by a chef at the Watergate Hotel where it was served during brunch on the weekends. Again this story is just a rumor and was not verified by anyone. In the late nineties, syndicated columnists “Anne & Nan” said that the name originated from a cake recipe with similar ingredients. Watergate Cake reportedly came out during the Nixon Watergate scandal and “has a ‘cover-up’ icing and is full of nuts”. No matter what the origin, Kraft says they changed the name when consumers were asking for the recipe by name… they were calling it Watergate Salad. There are no special tools needed for making Watergate Salad. It’s simple to make and easy to store and transport. I prefer using a sturdy rubber spatula instead of a wooden or stainless steel spoon for mixing because you can easily clean the side of the bowl. If you’re making this to take with you, make it right in your storage container and put the lid on when you’re done! In a large bowl combine the drained pineapple and the pudding mix. Stir to coat. Add Cool Whip and stir to coat. Add coconut and marshmallows; stir to combine. If you like, decorate the top with cherries and marshmallows. Chill for at least an hour before serving. As long as you drained your fruit well, this salad should hold up for 3-5 days covered in the refrigerator. Fruit that is not drained well will still retain liquid, which will separate from the whipped topping. We do not recommend freezing this dessert as the whipped topping will break down. What is the original Watergate Salad recipe? There are many variations of this dessert, but Kraft’s original version contains drained, crushed pineapple, pistachio pudding, miniature marshmallows, pecans and Cool Whip. Over the years people have added flaked coconut to the mix and some have omitted the nuts due to allergies. The only difference between ours and Kraft’s is the nuts/coconut. To make Kraft’s version remove the coconut from ours and add in 1/2 cup chopped pecans. How many calories and carbs is in Watergate Salad? We have a nutrition label at the end of the printable version of the recipe below. There are 152 calories and 33 g of carbs per serving. This recipe serves 8 people, each serving measures 1/2 cup. These nutritional facts are based on the ingredients listed in our recipe card, which uses non-fat Cool Whip. How do you make homemade Cool Whip? If you prefer to make your own, my friend Lynne has a recipe for stabilized whipped cream that you can use to replace the Cool Whip in this recipe. She uses cream cheese and confectioner’s sugar to make the whipped cream thicker and more stable. 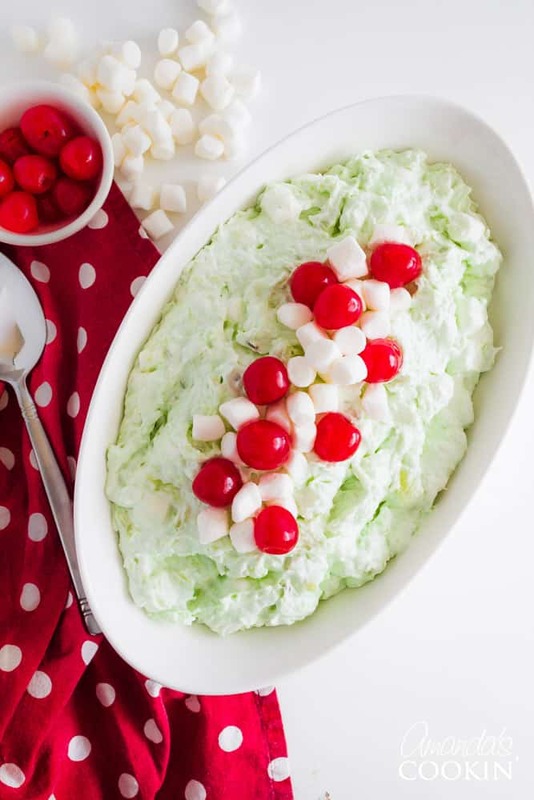 Will you be adding this Watergate salad to your holiday table this year? I know I will be. If you’re looking for more holiday desserts, be sure to check out one of my favorite cookie recipes this time of year, these Thumbprint Cookies. Or this Saltine Toffee, which is a really popular holiday dessert and is also very addictive! 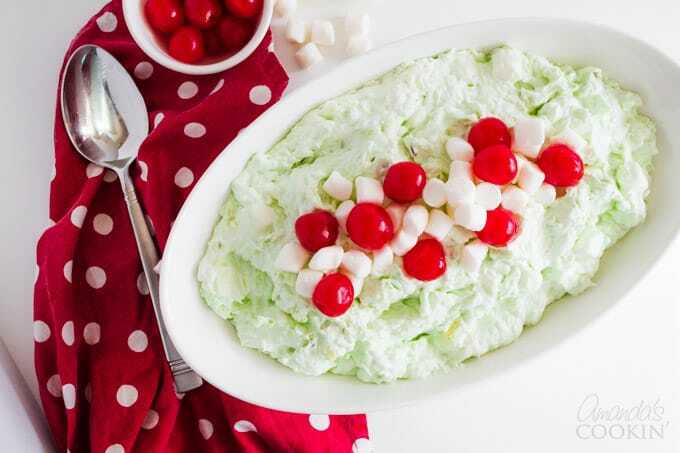 Watergate salad was something I ate at family gatherings when I was a child. It's that fluffy green pistachio flavored dessert brimming with marshmallows! In a large bowl combine the drained pineapple and the pudding mix. Stir to coat. Add Cool Whip and stir to coat. Add coconut and marshmallows; stir to combine. If you like, decorate top with cherries and marshmallows. Chill for at least an hour before serving. This post was originally published on this blog on Aug 7, 2014. The *original* Kraft recipe calls for UNDRAINED crushed pineapple. It will make a HUGE difference to the recipe if you drain it so DO NOT DRAIN THE PINEAPPLE. That’s true, they do call for undrained pineapple on the Kraft recipe. You can make it either way. thank you for posting recipe. Re: the cool whip, is it actually 1-1/2 cups measured out or just a small container which is 8 oz. What a blast from the past! :) And just using that phrase makes me feel old. I don’t think I’ve ever made this salad but remember it well from pot lucks. 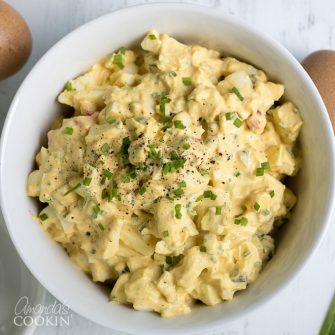 Great memories with this salad recipe! I use stabilized whipped cream to replace the cool whip, nothing can beat the real thing. We also like our salad a little more creamy so we add about 1/2 c. milk to the pudding mixture. I love fresh whipped cream too Jean :) Your version sounds great!